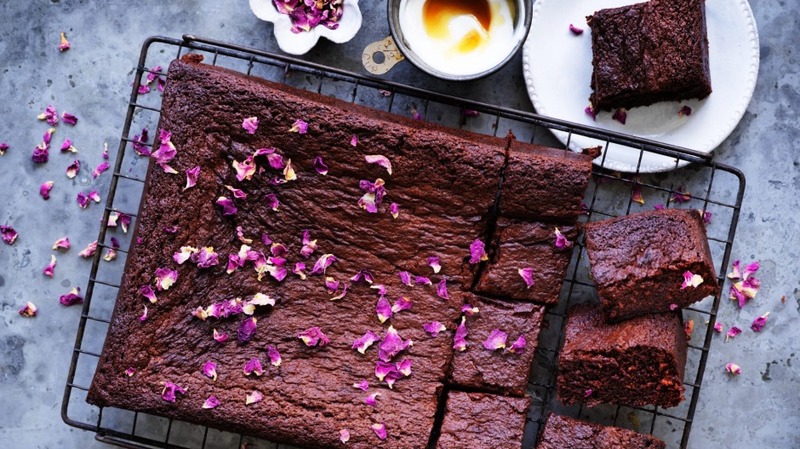 This tahini-enriched chocolate brownie is scandalously rich inside while being reassuringly soft and light. Serve in small portions – if at all possible. 1. Pour 100 millilitres of boiling water over the dates and bicarb soda in a heatproof bowl and set aside for 20 minutes, then whiz both dates and liquid in a blender until smooth. 2. Combine the tahini, chocolate and butter in a heatproof bowl set over a pot of barely simmering water, stirring until melted. Remove from heat and allow to cool for 15 minutes. 3. Heat the oven to 180C and line a 20-centimetre x 30-centimetre baking tin with two overlapping sheets of baking paper, leaving overhang as "handles". 4. Beat the eggs and sugar for three minutes, until pale and creamy. Beat in the tahini/chocolate and the date mixtures. Fold in the flour and a pinch of sea salt, and pour into baking tin. 5. Bake for 30 to 35 minutes until an inserted toothpick comes out almost, but not quite, clean. Cool for 30 minutes and cut into 12 squares.